I love messing with recipes. 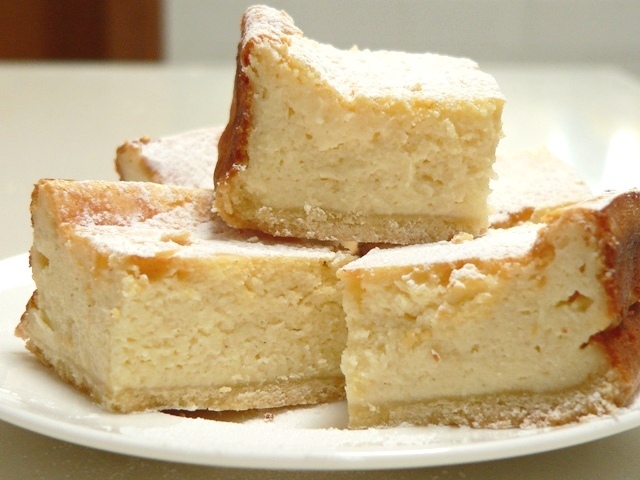 Today I took my ricotta cake recipe and turned it into a slice. It was the simplest of things to do. What I’ve discovered is this – the texture of the filling is dependent on how you treat the egg whites. If you don’t beat the egg whites at all, and simply stir the whole eggs into the mix, your filling will be smooth and cheesecake-like. In this case, I’ve done both – I’ve mixed one whole egg into the mixture with two yolks, then whipped the remaining two whites up and folded them into the batter. 1. Grease a 27.5 x 23 x 5.5 cm pan with oil spray, then line the base with parchment paper. I used this pan. Preheat the oven to 150C with fan. 2. Roll out a rectangle of pastry and line the base of the pan. 3. In a large mixing bowl and with a large fork, mix together the ricotta, sour cream, icing sugar mixture, cornflour, cinnamon and vanilla. Add one whole egg and two egg yolks, reserving the two remaining egg whites in another bowl. 4. Beat the remaining egg whites until stiff, then carefully fold them into the batter. Pour the batter into the prepared tin with the pastry base, then bake in the oven for 40 minutes. The filling will set, and the slice will brown slightly on top. Turn off the oven and allow the pan to cool, with the door ajar, for at least an hour. 5. Remove the pan and refrigerate until cold, preferably overnight. 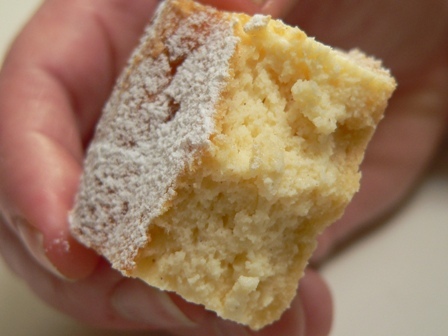 Cut into squares, dust with icing sugar and serve. Pete thought it needed dressing up, so we added a little berry coulis and some fresh strawberry! Damn it! I was travelling so well till I saw this! Yum that looks fantastic. I really should stop reading your blog first thing in the morning….not a good way to start the day craving for a piece of ricotta slice! I love messing with recipes too…particularly when something fabulous emerges quite unexpectedly. got one in the oven – fingers crossed. I visited Paesenalla on Tuesday, so had the fresh ricotta burning a hole in my pocket. . . So (true confessions here) we had to sneak some even without waiting for it to be cold – utterly GORGEOUS!!! 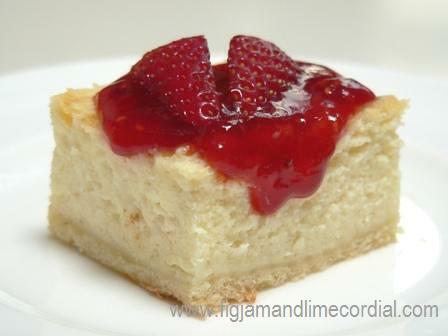 thanks so much for this recipe Celia. Anne, hooray! Thanks for letting me know – so glad it worked well for you!